Hello Everyone! How was your weekend?!!? I hope it was TONS of FUN! Mine was busy and fun! Kate participated in her first barrel race with Shyanne and did a GREAT job! She didn't make it to the finals, but she had four great runs! I have LOTS to share with you today! A great opportunity to JOIN MY TEAM and a TERRIFIC paper sale! Yep...that's right! 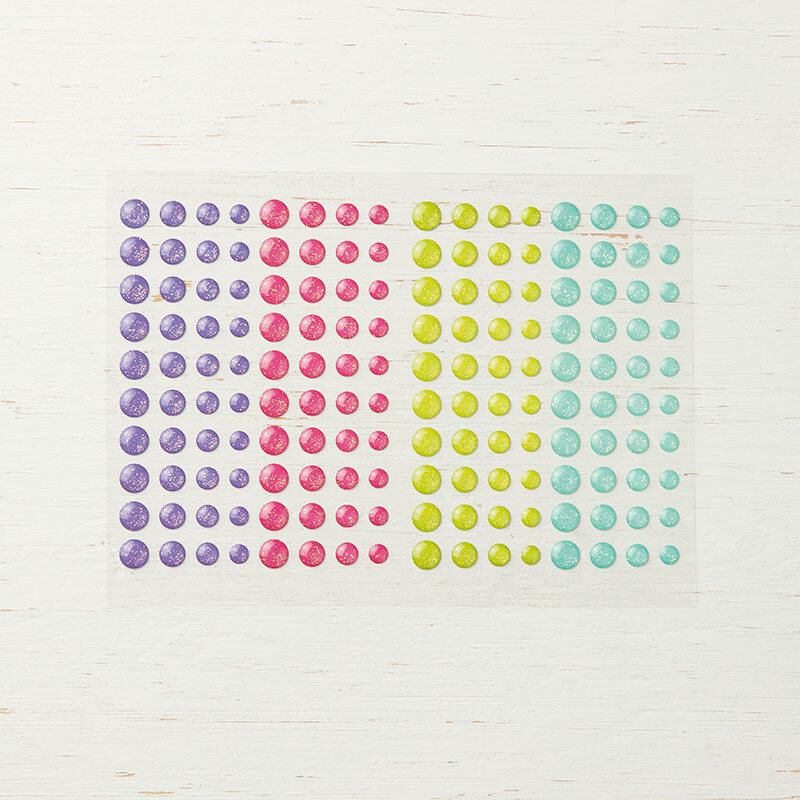 You get a set of 10 ink pads FREE, just for joining SU! That's in addition to $125 worth of product (of your choice) for $99...with FREE SHIPPING! There's NO COMMITMENT either...it's a great time to try it and see if it's for you! Click on Join Now at the top of my blog to become a member of my team! Yep...Designer Paper is on sale! It's a GREAT time to stock up! Click on Shop Now at the top of my blog to see what DSP is on sale and get yours now! I have a "Make-It Monday" to share with you today! 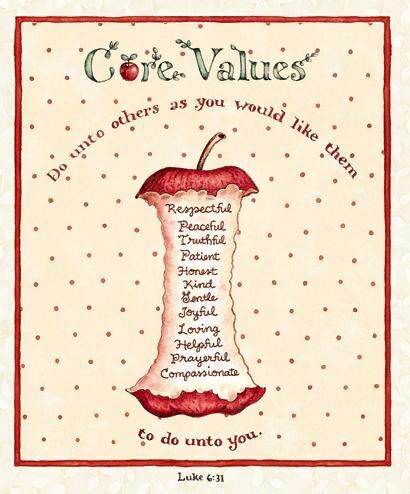 It's from my Up-Upline Stella McKay! If you look back at my posts it's really similar to one of my own creations that I shared with you back on June 13th! I hope you will be INSPIRED! Run Flirty Flamingo card base through Tufted Textured Impressions Embossing Folder and Big Shot. Set aside. Ink large elephant with Basic Gray, stamp on Whisper White cardstock and punch out. Ink hearts in Flirty Flamingo and stamp onto Whisper White positioning with future die cutting in mind. 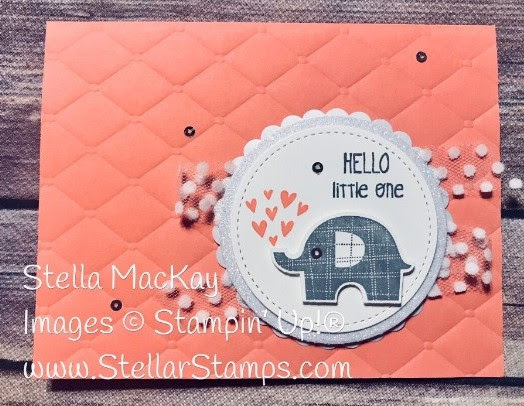 Ink sentiment with Basic Gray and align accordingly making sure to leave room for elephant later and within area to be die cut and aligned with hearts. Using the 2-1/2” circle from Stitched Shapes Framelits, die cut Whisper White taking care to leave room for elephant. Using the 2-3/4” circle from the Layering Circles Framelits, die cut Sparkle Glimmer Paper. 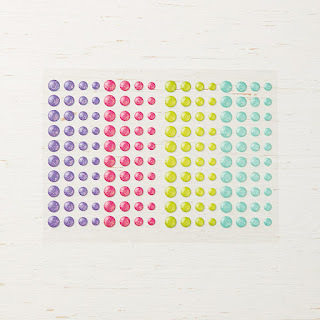 Adhere Whisper White portion to Glimmer Paper using Mini Glue Dots. Lay down ribbon on work area to create a “Z” shape. Adjust so that loops of ribbon and ends will peek out behind focal point. Cover back of Glimmer Paper with SNAIL then carefully press down onto ribbon so it is shown evenly on left and right side of focal point. A strip of household tape over the ribbon should add extra security. Add a little more SNAIL and press down focal point with ribbon onto one Pearlized Doily. Apply SNAIL again and adhere to card front as shown. Using tweezers and a drop of Multipurpose Liquid Glue, lightly dab a tiny bit of glue onto back of Mini Sequin Trim that have been removed from its thread. Press to card in desired location. Add one sequin as the elephant eye.